While browsing for coats on Bluefly, I spotted other lovely things guaranteed to keep you cozy and cute during the winter. Enjoy! C3 Collection ivory cashmere squirrel sweater, $126.65. 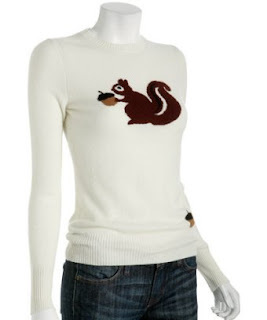 Wearing this sweater with Wendy's squirrel necklace would be cuteness overload in the best possible way. 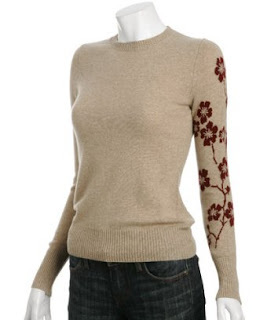 C3 Collection wheat cashmere flower sweater, $126.65. With cherry blossoms encircling one sleeve, can spring be far behind? 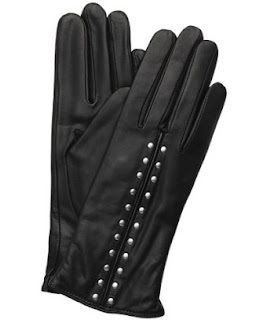 MICHAEL Michael Kors black leather 'Astor' studded gloves, $48.45. I have yet to find a pair of leather gloves with a fit that's satisfactory, but I do love the double row of studs on these beauties. Just beware of Bluefly if you're shipping to Canada. On top of the usual taxes and customs fees you will also be hit by a huge "brokerage fee" charged by the company they use to ship. It's disappointing because there is a lot of cute stuff there. I have to force myself not to look! Ooh nice tip Em! Love the studs on those gloves. Now that you mention it, Em, I remember you saying something about the Bluefly brokerage fee before. Thanks for the reminder! Bluefly is so addictive. I love that sweater with the squirrel on it - It's kitschy and fashionable! That squirrel sweater cracks me up. great finds, especially those gloves. I am always looking for gloves but I have such small hands that I can never find any that fit me!